The 2017 election in five minutes Jump to media player Some of the highlights of the BBC's coverage of the 2017 general election. Behind the scenes at BBC's referendum HQ Jump to media player As the referendum results came in on Thursday night, reporter Adam Fleming went behind the scenes at the BBC's referendum results programme. David Dimbleby caught out in 1987 Jump to media player David Dimbleby is caught eating a chocolate bar while presenting the BBC's election night coverage in 1987. 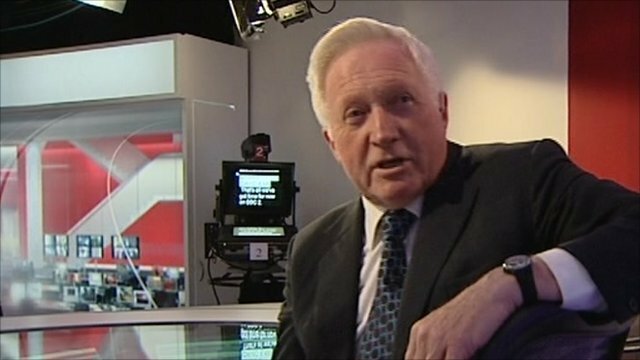 Election night and how to stay up Jump to media player David Dimbleby and Emily Maitlis explain the secrets of staying up all night for the election outcome as Adam Fleming explains what results will come in when for the 24 hours after polls close on Thursday evening. David Dimbleby, who has hosted Question Time since 1994, has said he is going to leave the programme at the end of the year. He's said that he plans to return to his first love of reporting, after he hosts his final show in December. Here are some memorable moments from his time at the helm.